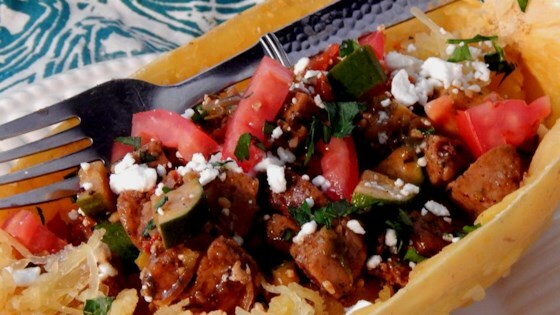 "A fun way to make spaghetti squash the main event in this unique and filling dish." Preheat oven to 350 degrees F (175 degrees C). Coat large baking dish with cooking spray. Place spaghetti squash cut-side down in prepared baking dish. Bake in preheated oven until spaghetti squash is tender when pierced with a fork, about 45 minutes. Turn squash over and bake for another 5 minutes. Remove spaghetti squash from oven. Scrape the strands from the skin and place into a large bowl. Heat 1 tablespoon of olive oil in a large skillet over medium heat. Add Italian sausage and cook, stirring occasionally, until sausage is brown and crumbly, 5 to 8 minutes. Remove sausage. Return skillet to heat; add 1 tablespoon olive oil, spring onions, and garlic, cook and stir until onions are softened, about 5 minutes. Add zucchini, red peppers, and Italian seasoning and continue to cook and stir until the vegetables are soft, about 5 minutes. Stir spaghetti squash and feta cheese into vegetable mixture; cook and stir until cheese melts, about 3 minutes. Stir sausage into vegetable mixture; season with salt and lemon pepper. Sprinkle tomato and parsley on top to serve. I really loved this dish. I substituted vegetarian Italian sausage for the meat sausage. It was was delicious and healthy. Everyone in the family loved it. Even my 2 teenage sons that are no fans of squash. Only thing I changed was to add black olives on top. We will make again! I made this exactly as written, but doubled hopping to have leftovers. My hopes were shot as everyone went back for seconds! We LOVED this meal!